HipMarrakech believe honest photographs are the best possible aid to informing your holiday choices. For this reason we are delighted to recommend the work of Marrakech based photographer Alan Keohane. 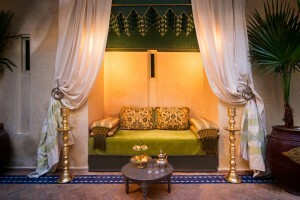 Alan photographs the intimate spaces inside Marrakech Riads with a rare sensitivity, instinctively capturing the mood of the accommodation that is unique to Marrakech. Check out his work on our profiles of Darhani, Riad Papillon, Riad Cinnamon, Dar El Souk, Dar Habiba and Les Trois Mages among others. Alan has photographed some of the iconic images of modern morocco contributing to numerous guides, books and magazines. His fine art prints are on sale in the most exclusive boutiques in Marrakech. Explore more of his work on his Still-images website. This entry was posted on Thursday, December 27th, 2012 at 9:06 am	and is filed under Beyond Marrakech and the Atlas Mountains, Marrakech. You can follow any responses to this entry through the RSS 2.0 feed. Responses are currently closed, but you can trackback from your own site.